Winters tend to be very mild here in Southern California, even wet ones like this year. And warm temperatures come sooner and sooner every year. Even though it won’t officially be spring for another week, you’re probably using your air conditioning system already to help keep your home comfortable, and that AC use is only going to increase in the next few weeks and months. 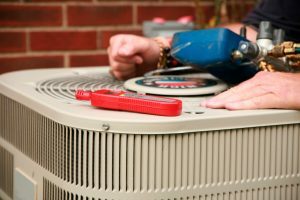 If your air conditioner shows signs of trouble, now is the right time to deal with it: when the weather is still relatively cool and you can set up a repair session without triple digit temperatures turning your home into an oven. A formal diagnosis of any problem requires a trained technician, and layman should never attempt repairs on their own under any circumstances. (Proper licensing is required and the presence of dangerous components such as refrigerant means that formal training is an absolute necessity.) Having said that, most homeowners can spot the basic signs that something is wrong, and call in a repair service to get the issue looked at. Generally speaking, anything out of the ordinary should be a cause for a concern. Most of us become accustomed to our air conditioner’s normal function, which makes it very easy to spot signs of trouble when they appear. More specifically, keep an eye out for these common signs, which recur over a wide variety of issues. Strange noises. Anything from whistles to hums to bangs and shudders. Anything that makes a noise you don’t recognize as normal should be cause for concern. Low air flow. Air out of the vents should have a uniform flow. If it slows down, it usually means that there’s either something blocking the flow of air, or there’s a problem with the fan motor (or the fan itself). It the low air flow affects only one vent, it’s likely a problem with the ducts. If it affects all of them, the problem is likely with the air conditioner itself. Reduced cooling power. Obviously, you’ll know there’s a problem if the air conditioner blows hot air. But it’s also problematic if the air is cool, but less cool than you’d expect. This can come from something simple, like low refrigerant, or something more serious, like an overheating component. Higher bills. Sometimes, the issue isn’t large enough to actively alter the functioning of the system, but it can wear on one or more of the components. This reduces the system’s effectiveness and forces it to work harder to do the same job. You’ll notice this in unexpectedly high bills, which will come despite the fact that you don’t believe you used the air conditioner more than you normally do. When you spot these symptoms, don’t attempt anything further. Instead, turn it off – even if it’s a warm day – and call in a repair service. Doing otherwise runs the risk of more damage and possibly turning a minor repair job into a major one. Once the air conditioner is turned off, contact Greenleaf Heating & Cooling. We provide air conditioning repair services throughout the Whittier, CA area!